…or a boa, or any other non-native, invasive snake. You’ve seen the news reports. You know they are here. But have you ever actually seen a python while out hiking in southwest Florida? And what should you do if you see one at CREW? The first known sighting of a python in CREW occurred in Bird Rookery Swamp in 2005. Since then, no other sightings have been reported in the watershed – until this year. 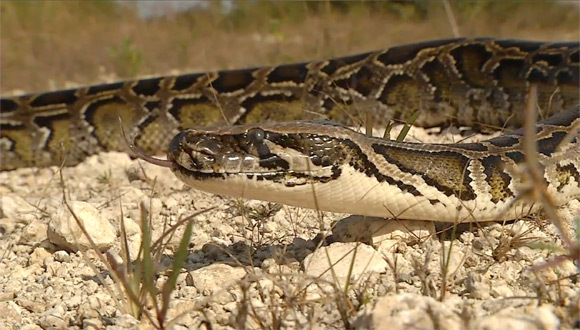 In June 2013, a 10-foot python was seen near the CREW field office off Corkscrew Road in Lee County. Last week, a 9-foot common boa was found by exotic plant treatment contractors in Flint Pen Strand off Bonita Beach Road. These two recent sightings confirm that these large non-native snakes are moving into the CREW watershed, so we want you to know what to do if you see one while out hiking on the CREW trails. First – do not approach the snake, but do confirm its identity, and if you can, take a photo and mark the GPS coordinates of the snake’s location. Second – if the python or boa is still in your view and staying put, call the FWC Exotic Species Hotline number 888-IVE-GOT1 (888- 483-4681) to report the location. Do not attempt to remove the snake. Only permitted, trained individuals may remove pythons or boas (also known as conditional species) and even then only from certain Wildlife Management Areas and other public lands with permits/permission from both FWC and the landowner. Reporting your sighting helps FWC, the SFWMD, and other agencies manage these invasive exotic species and determine their distribution and range. 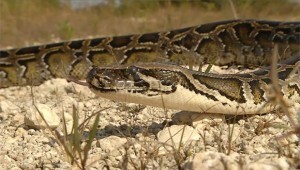 Burmese pythons and boas are non-native snakes introduced in Florida by accidental and intentional releases by pet owners. They can be found in or near freshwater aquatic habitats like marshes and swamps and can grow up to 20 feet in length. They eat alligators, birds, mice, rabbits, raccoons, deer, and other small mammals. To learn more, visit the Python pages on the FWC website. One Response to "How to Report a Python Sighting at CREW"